Plaque unveiled on Sunday, 9th March, 2014. 1. HOOD, R. T. Richard Thornton HOOD, b. 1906, Melbourne, Victoria, son of George Hamilton HOOD & Eliza Gertrude Ann THORNTON. During WW2 he enlisted and served in the RAAF and was discharged in 1946 as a Flight Lieutenant. He was married at Geelong in 1939 to Claire Agnes "Doodie" ANDERSON, b. 1913 Geelong, Victoria, daughter of Harry Arthur ANDERSON & Margaret Jessie BELL. Claire was a champion golfer in the 1950s. Richard HOOD died in 1975 and Clair in 1987, and both are buried at Apsley, S-W Victoria. 2. KAUFMANN, L. R. Louis Robert Ernest "Lou" KAUFMANN, b. 1901, Geelong, Victoria, son of Albert Isaac Louis KAUFMANN & Maibella Fanny "Mabel" JOHNSTON. He was living at Skipton, Victoria in 1940 when he enlisted in the 2nd AIF and was discharged in April 1943 as Staff Sgt., Australian Port Detachment, 2nd AIF. His younger brother Hope Albert KAUFMANN died on Rabaul in 1942 with the 2/22 Infantry Battalion, 2nd AIF. Louis was married at Melbourne, Victoria in 1926 to Una Mary ALLARD, b. 1901, Melbourne, Victoria, daughter of Charles Mumford ALLARD & Ellen Annie "Nell" STAPLETON. Louis died at Geelong in 1974 and his wife Una died in 1984. 3. BOYTON, R. Roger BOYTON, b. 1917, London, England, son of Robert Charles BOYTON & Hilda Lucy Ann GALL. Roger arrived in Australia with his parents in 1925. They settled at Avoca, Victoria and opperated the "Green Hills Hotel" at Condah, S-W Victoria in the 1930s. In 1938 they took over the "Lake Wallace Hotel" Edenhope, S-W Victoria. Roger enlisted in the 2nd AIF in Jun 1940, and was discharged in Sep. 1945 as Cpl, 2/2 Anti Aircraft Regiment, 2nd AIF. He was married in 1940 to Waveney Irene "Bunny" RUNDELL, b. 1918, Portland, S-W Victoria, daughter of Richard Hocking RUNDELL & Ann BOWER. They had 4 children. Roger died in 1996 and was buried at Edenhope. 4. WHITTINGHAM, T. L. Thomas Leslie WHITTINGHAM, b. 1903, Edenhope, S-W, Victoria, son of Thomas WHITTINGHAM & Sarah CLARK. He was at Edenhope in July 1940 when he enlisted in the 2nd AIF and was discharged in April 1944 as Pte, HQFBSA, 2nd AIF. He was married in .... to Kathleen Mary PREECE, b. 1919, Sandford, S-W Victoria, daughter of James Alexander PREECE & Adelaide Phoebe CUTCHIE. Thomas died in 1969 and Kathleen died in 1970 and both are buried at Edenhope. 6. KINNANE, T. J. Thomas Joseph KINNANE, b. 1912, Echuca, Victoria, son of Thomas Bartley KINNANE & Margaret May EVANS. He was a dairy farmer at Drumborg, near Heywood, S-W Victoria when enlisted in Feb. 1942 in the 2nd AIF. He was discharged in Oct. 1944 as Pte 2/24 Battalion, AIF. Thomas was married in 1939 to Margaret Cameron "Madge" CLARKE, b. 1914 Portland, S-W Victoria, daughter of John Thomas CLARKE & Elizabeth Alice PHILIP. They had 4 children. Thomas died and was buried at Geelong in 1969. 7. KAIN, P. Philip KAIN, b. 1911, Native Valley, near Nairne, South Australia, son of James patrick Francis KAIN & Sarah Emily LEWIS. He enlisted in the 2nd AIF in Jun 1940, served with 2/43 Battalion, 9 Aus. Div. Carrier Coy, and saw service at Tobruk, North Africa. He was discharged in September 1945, did not marry and died and was buried at Horsham, Victoria in 1976. 8. de FREDRICK, C. H. Charles Horace de FREDRICK, b. 1903, Diamond Creek, Victoria, son of Charles Henry de FREDRICK & Josephine WARD. He enlisted in the 2nd AIF in August 1940 and was discharged in November 1945 as L/Bdr 2/11 Field Regiment, Australian Artillery, 2nd AIF. He was married in 1932 to Jane Rosa Farrin WEBB, b. 1895, Melbourne, Victoria, daughter of Raymond Albert WEBB & Jane WORRELL. They had 3 children. Charles died at Naraccorte, SA in 1954 and Jane died at Hamilton, Victoria in 1968 and both are buried at Apsley, S-W Victoria. 9. BLOHM, B. E. Benjamin Edward BLOHM, b. 1918, Wallacedale, S-W Victoria, son of Willy BLOHM & Cecilia Sophie DAHLITZ. He lived at Wallacedale until he enlisted in the RAAF in April 1941. He was discharged in September 1945 as an LAC at 2nd Aircraft Depot, RAAF. He was married in 1944 to Grace Rosita BARBETA, b. 1921 Melbourne, Victoria, daughter of Tony BARBETA & Daphne MARTIN. They had 6 children. 10. WOONTON, W. A. William Alfred WOONTON, b. 1922, Sea Lake, Wimmera, Victoria, son of William Richard WOONTON & Olive Maud ADAMTHWAITE. He enlisted in the 2nd AIF in March 1943 and was discharged in May 1944 as Pte 2/4 Infantry Battalion, 2nd AIF. He married Margaret Amy ROBERTSON. William was buried at Warrnambool, S-W Victoria in 2007. 1. THORNTON, E. W. Errol Walter THORNTON, b. 1914, Adelaide, South Australia, son of Walter Archibald THORNTON & Henrietta Mary Ann WALLIS. He enlisted in 1940 and was discharged in 1947 as Capt. 2/43 Battalion, 2nd AIF. He married in 1940 in Adelaide, SA to Margaret Isabel "Peggy" DEANS, b. 1917, Adelaide, SA, daughter of Robert Forrest DEANS & Dorothy Frances SNOW. He died in 1967 and is buried at Edenhope, S-W Victoria. Norman James "Norm" JOSEPH, b. 1919, Newtown, Sydney, New South Wales, Australia. WW2 service 1940-43 in the RAN, enlisted 1 October 1940, NOK Mary JOSEPH, discharged 13 March 1943 as Steward, HMAS Rushcutter. He married Marion Ellen ROBERTSON, daughter of Robert Gerald ROBERTSON and Catherine Agnes KELLY of Edenhope, Vic. 7 children. 4. LAMSHED, R. C. Ronald Clarence Farrow "Ron" LAMSHED, b. 1920, Moonta, South Australia, son of Albert Clarence LAMSHED & Cecelia Eliza FARROW, who married in 1918 in London, England when Albert was with the 1st AIF. Ron enlisted with the RAAF at Adelaide in 1942 and was discharged in 1945 as a Flying Officer with 296 Squadron, RAAF. He was married in 1947 at Adelaide, SA, to Ruby Adelaide WILKINSON, b. 1924, Adelaide, SA, daughter of George Edward WILKINSON & Ruby Victoria DOUGLAS. 4. BURNS, R. M. Ruben May BURNS, b. 1922, Edenhope, S-W Victoria, son of William Henry BURNS & Eva May KEALY. He enlisted in 1942 and served in the 2nd AIF as Tpr 2 / 9th Cavalry Regiment and was discharged in 1946. He married Alice ....... .
6. FARRAN, J. C. John Cunninghame "Jack" FARRAN, b. 1903, Geelong, Victoria, son of Charles Walter Cunningham FARRAN & Helen Beatrice HOPKINS. He was residing at Barimah Plains, Victoria when he enlisted in the 2nd AIF in 1939. He was discharged after service and time spent as a P.O.W. in 1944 as Sgt 2 / 7th Infantry Battalion, 2nd AIF. He was married in Melbourne in 1947 to Augusta Mary "Molly" WYNTER from Ayr, Queensland. They were living at "Bamboa" Strathdownie, S-W Victoria in 1950-52 prior to obtaining this Soldier Settlement block at "Mundarra Park" near Edenhope. 7. ENRIGHT, L. D. Leslie Daniel "Les" ENRIGHT, b. 1910, Adelaide, South Australia, son of Sidney James ENRIGHT & Olive Sylvia Adelaide COOMBS. He was residing in Adelaide, SA in July 1941 when he enlisted and served in the 2nd AIF and was discharged in July 1942 as Pte 1st Armoured Division, 2nd AIF. He .... .
8. MacKENZIE, K. J. Kenneth John "Ken" MacKENZIE, b. 1912, Balranald, NSW, son of Roderick Alexander MacKENZIE & Elizabeth Jane SINCLAIR. He appears to have married in 1930 to Isamay STEVENSON, b. 1910 Melbourne, Victoria, daughter of Angus STEVENSON & Mary McKinnon Grant BUDGE. They were living at Hillston, NSW in 1942 when Kenneth enlisted in the 2nd AIF and was discharged in 1945 as L/Cpl 24 Field Park Company, Australian Engineers, 2nd AIF. Kenneth died and was buried at Edenhope, S-W Victoria in 1956. An advertisement in "Mufti" this month draws the attention of ex-servicemen to land available for settlement under the Soldier Settlement Act. "Mundarra" Estate is to be broken up into 10 lots, ranging from 700 to 1170 acres, suitable for grazing (sheep) and cropping. "Mundarra" is eight miles south-west of Edenhope, and seven miles south-east of Apsley. Source : "The Horsham Times" (Vic.) Friday, 10th December 1948. TENDERS are invited for the erection of six (6) farm house units of timber construction on "Mundarra" Estate situated about 9 miles south-west of Edenhope and about 7 miles south-east of Apsley. Plans and specifications may be inspected at the offices of the Soldier Settlement Commission, Treasury Gardens, Melbourne and Hamilton, Shire Office, Edenhope, the Offices of the Department of Lands, Mount Gambier, S.A., the Offices of the Developmental Executive, Penola, S.A., and at the Offices of the Architects, Messrs. Buchan, Laird and Buchan, Bank of New South Wales Building, Moorabool Street, Geelong, and 70 Pasley Street, South Yarra, Victoria. The commission will arrange for the supply of cement, roofing and tank iron and, where the successful tenderer is genuinely unable to procure weatherboards and flooring, the Commission will assist him to do so. Tenders, (envelopes to be clearly marked "Tender, Houses") will close at the offices of the Soldier Settlement Commission, Melbourne, at 12 noon on Monday, December 5th, 1949. Source : "The Border Watch" (Mount Gambier, SA) Tuesday, 22nd November 1949. Notification is hereby given in accordance with Section 16 of the Soldier Settlement Act 1946 that the undermentioned lots are available for settlement. Any discharged soldier who has applied to the Commission on or before the 21st. February 1951 for classification in the required class or classes of primary production for which the lots are made available and whose application has been accepted but not necessarily finalized, or any discharged soldier who has been classified as suitable in such class or classes of primary production may apply on the prescribed form for settlement on any lot or lots, indicating where he applies in respect of more than one lot, his order of preference therefor. The prescribed application forms, plans and further particulars may be obtained from the Enquiry Branch, Soldier Settlement Commission, State Public Offices, Melbourne. The closing date for the receipt of completed applications for settlement on these holdings is the 19th March, 1951 ; such applications to be in the hands of the Secretary, Soldier Settlement Commission, on or before that date. SUBDIVISION OF "MUNDARRA PARK" ESTATE. Situated about 5 miles west of Edenhope. 8 holdings varying in area from approximately 660 acres to 1004 acres. SUITABLE FOR GRAZING (SHEEP) & MIXED FARMING. Source : "The Argus" (Melbourne, Vic.) Saturday, 24th February 1951. Notification ls hereby given that the undermentioned holdings are available for settlement. Any discharged serviceman who has been classified as suitable for the class or classes of production for which this land has been made available or whose application for classification has been accepted but not finalised, may apply on the prescribed form for settlement on the undermentioned holdings. Prescribed application forms, plans and further particulars may be obtained from the Enquiry Branch, Soldier Settlement Commission, Public Offices, Melbourne. Closing date for the receipt of completed applications on the holdings is the 19th November, 1956, at the Commissions Melbourne Office. This holding (Lot 10), comprising an area of 706 acres, 3 roods, 23 perches is situated about 7 miles south of Apsley and about 12 miles west of Edenhope. SUITABLE FOR GRAZING (SHEEP) AND MIXED FARMING. Source : "The Argus" (Melbourne, Vic.) Saturday, 3rd November 1956. 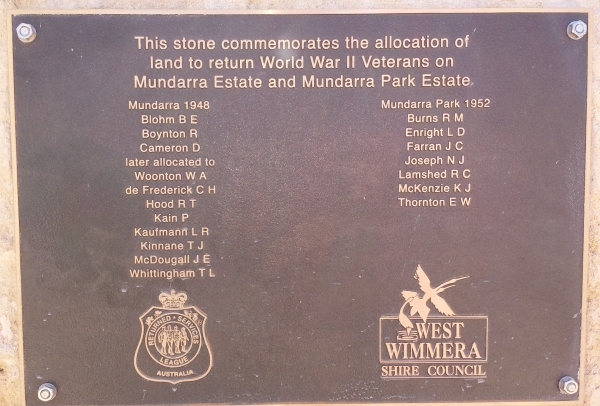 Information on the "Mundarra" & "Mundarra Park" schemes, the soldiers, families, etc..., appreciated.